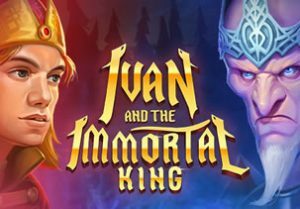 Based on a Russian folk tale, Ivan and the Immortal King is a 5 reel, 20 payline slot game from Quickspin. Work your way through the different levels of the free spins round and you could see your wins boosted by multipliers that can top 20x. Play on all devices from between 20p and £100 per spin. There’s plenty of back story here. The goal is to try and slay the immortal King Koschey - the way to do that is to find his soul which is hidden inside a needle, which is in an egg, which is in a duck, which is in a chest. To be successful, you need to find the chest, then kill the hare, capture the duck, open the egg and then break the needle. Confused? It all becomes clear in the Free Spins feature, more of which below. As usual for a Quickspin slot game, the design impresses. Set against a forest backdrop, the reels include gemstone symbols plus a dragon, a wolf and a princess and the Immortal King. Ivan is the best payer. Land 3, 4 or 5 of them on a payline and you’ll win a payout of 2, 20 or 100 times your total stake. There’s also a wild that replaces everything bar the scatter. It too offers awards of up to 100 times your total stake per payline. There are 2 main extras on offer in Ivan and the Immortal King. Baba Yaga Surprise feature - Baba Yaga is a witch who can appear at random on any spin and hide 4 adjacent symbols. These will then either turn into the same matching standard symbol or wild to guarantee a win, or into bonus scatters which can trigger the Free Spins feature. Free Spins feature - land 3, 4 or 5 bonus scatters and you’ll trigger the second feature and with it an initial allocation of 10, 14 or 18 free spins. Look out for special bonus scatters during the free spins - they all relate to the folk tale back story. Collecting 3 progress scatters adds another 4 free spins to your total as well as increasing a multiplier. If you work your way through all the levels and defeat the king, you’ll have earned a total of 30 free spins with a mighty multiplier of 20x on your last 4 free spins! The backstory part of this slot game sounds quite complex. It’s really not. Just collect scatters once you’ve triggered the feature to earn extra free spins and boost the multiplier up to 20x. This can lead to wins of 40,000 times your stake! As usual for a Quickspin slot game, this game is very easy on the senses. The comic book visuals are as well done as usual and there’s a lovely classical soundtrack playing as you spin too. The features are pretty good too. It all comes together very nicely. Our knowledge of Russian folklore isn’t really up to much but that doesn’t matter. Well designed and with some potentially exciting features, we’re happy to join Ivan in his battle with the Immortal King. If you like volatile games, Quickspin has plenty with Dwarfs Gone Wild and Tiger’s Glory recommended.